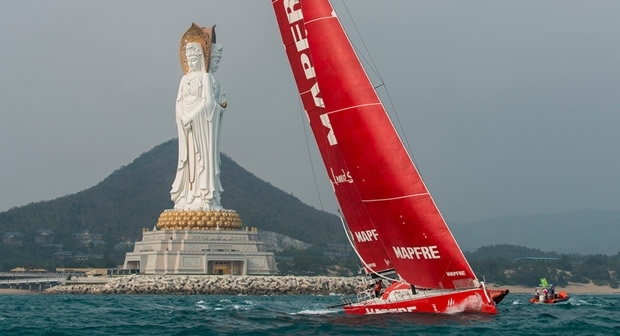 Despite sailing with half her crew replaced for this leg, Dongfeng Race Team led the six boats out of Sanya today at the start of leg four of the Volvo Ocean Race bound for Auckland. For Charles Caudrelier's crew, this represented a clean sweep of success in the Chinese team's homeport following her victory on leg 3 and in Saturday's In-Port race. The start took place at 1400 local time (0500 UTC) with a two lap inshore course close to the Sanya waterfront, before the VO65s headed away from the Hainan coastline into the open waters of the South China Sea. On Team Alvimedica skipper Charlie Enright and his crew kept clear of the traffic jams on the inshore section of the race course to take up second place behind Dongfeng Race Team as the fleet surfed away from Sanya along the coastline of Hainan island. Once into open waters, Team Alvimedica took the lead from the Chinese, but it was all still very close. Tough conditions lie ahead upwind with the wind building to more than 20 knots. On Team Alvimedica Enright was battening down the hatches, physically and mentally, for a tough opening to the leg. “My biggest concern is getting out of here in good shape, in potentially a big sea state. You don’t want to push so hard that you break the boat, but you want to stay with the pack too. The boat that goes out of here well could get a big jump,” he said prior to the start. During a busy stopover, the Turkish-American crew have put in more training time than any other crew, with Enright and the crew busy analysing sail shapes and rig set-up with Tony Mutter, a former multiple winner of the race who flew in from New Zealand for a few days’ coaching. It’s all part of Team Alvimedica’s ongoing mentor and coaching program, which has already seen useful input from former Volvo Ocean Race winner Stu Bannatyne and America’s Cup winner Dean Phipps. On Abu Dhabi Ocean Racing there was an 11th hour crew change when Alex Higby was awakened at 0700 this morning to be told to stand by for his first taste of Volvo Ocean Race duty. He has stepped in for Azzam’s Emirati sailor, Adil Khalid, who has been forced to stand down for the leg because of a vomiting bug. “I know Adil is devastated to have to miss Leg 4 and I have wished him a speedy recovery,” said Higby, who has been a member of Abu Dhabi Ocean Racing’s shore crew in the sail loft. “I haven’t had much time to think about the significance of getting the call-up from Ian, but I’m of course very excited to get the chance to sail in my first Volvo Ocean Race leg."